Many helping hands are needed Tuesday, April 30, to assemble koi nobori and bamboo poles. Please meet in the parking lot of Mokuola at 9 a.m. 4/30 if you are able to help. Koi is an ornamental variety of carp introduced to the rest of the world from Niigata at a World’s Fair in Tokyo in 1914. The fish is a symbol of strength and overcoming adversity. It expresses a wish for health and success. 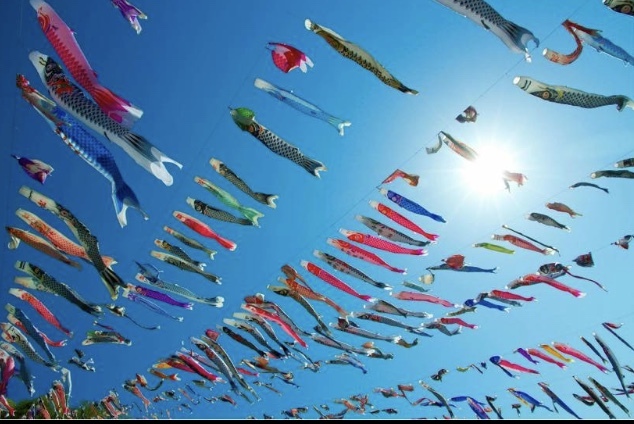 Koi nobori (colorful koi windsocks) are flown in Japan from April through early May in honor of Childern’s Day (May 5) known as Kodomo No Hi, which formerly was known as Boys’ Festival (Tango No Sekku). Children’s Day has been a national holiday in Japan since 1948. It is the last day of Golden Week. The tradition of flying koi nobori came to Hawaii with Japanese immigrants. The first group (Gannen Mono) arrived in 1868. The biggest waves of immigration from Japan started at the behest of King David Kalakaua. The first ship of Kanyaku Imin arrived in Honolulu on 8 February 1885. By the U.S. Federal Census of 1910, Japanese immigrants and their families accounted for 43% of the population of Hawaii. 2017 – the first of a three-year centennial celebration of Lili`uokalani Gardens – marked a return to flying koi in the Waiakea area. Friends of Lili`uokalani Gardens wishes to honor the tradition and bring attention to community events happening this week. 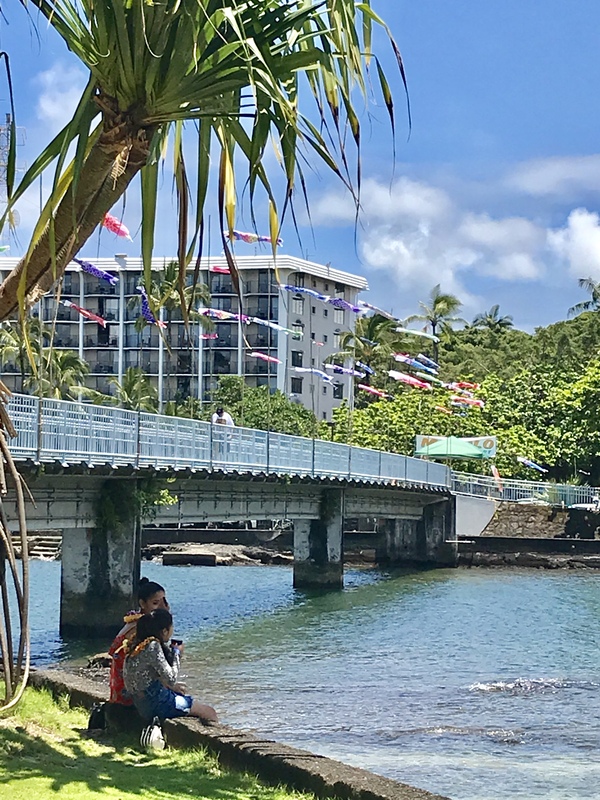 Hilo Lei Day Festival will be held in Kalakaua Park on Wednesday, May 1, starting at 10 a.m. The 8th annual AIDS Walk fund raising for the Hawaii Island HIV/AIDS Foundation will be held in Lili`uokalani Gardens on Saturday, May 4, starting with registration at 8:00 a.m. 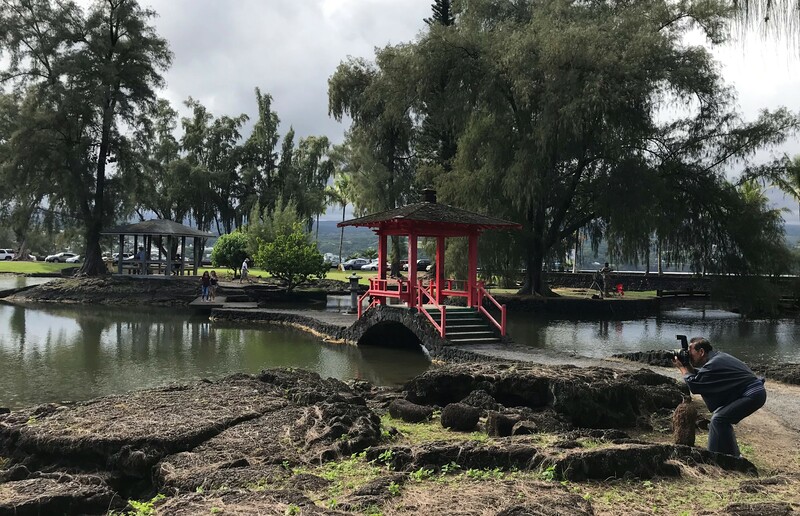 The Rotary Club of South Hilo annual fundraiser “Hilo Huli” will be held on Mokuola Sunday, May 5, starting at 11 a.m. Koi will fly until Hilo Huli is over. 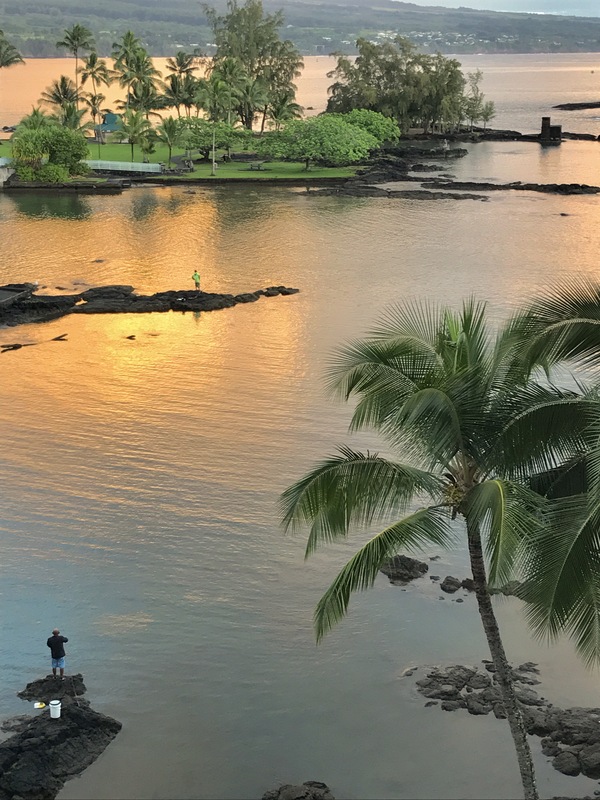 Koi nobori may be seen at Suisan Fish Market, Pandamonia’s Paleta Palace at Ali`i Ice, Lili`uokalani Gardens, Hilo Bay Cafe, Shoroan (the Urasenke tea house), Banyan Gallery, Castle Hilo Hawaiian Hotel, and the Grand Naniloa Resort among other Banyan Drive locations. The most colorful and abundant display will be on the bridge to Mokuola. For more information on Friends of Lili`uokalani Gardens, please take a look at our monthly electronic newsletter for April. 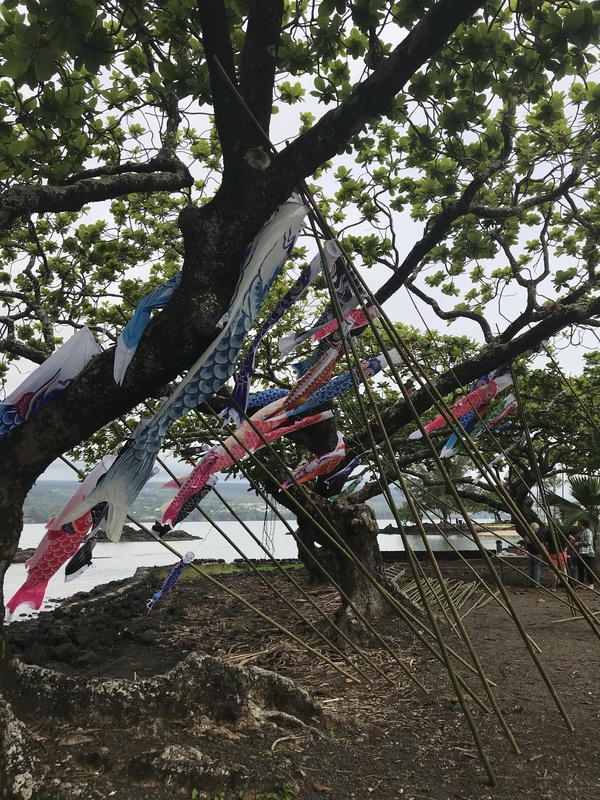 Several years ago, Friends of Lili`uokalani Gardens board member Kenji Kuroshima had this dream of flying koi nobori in the park for Boy’s Day (May 5). We don’t have the abundance of his dream — yet. With your help, Friends hope to increase the number of koi nobori this year. This was the reality last year — two koi nobori on each pole. More will fly this year from Tuesday, April 30, through Sunday, May 5. In Japan, koi nobori fly from April through early May to celebrate Children’s Day (Kodomo No Hi), a national holiday changed in 1948 to honor both boys and girls. Koi is a type of carp symbolizing courage and strength. Bamboo poles are harvested near Hirano Store on the Volcano Highway and each year are donated to local fishermen at the end of the display through the assistance of Suisan Fish Market. Koi nobori will be attached to freshly cut bamboo poles on Tuesday, April 30. Assembly area is adjacent to the parking lot at Mokuola, just off Lihiwai Street in Hilo. Many hands are needed for this annual activity. 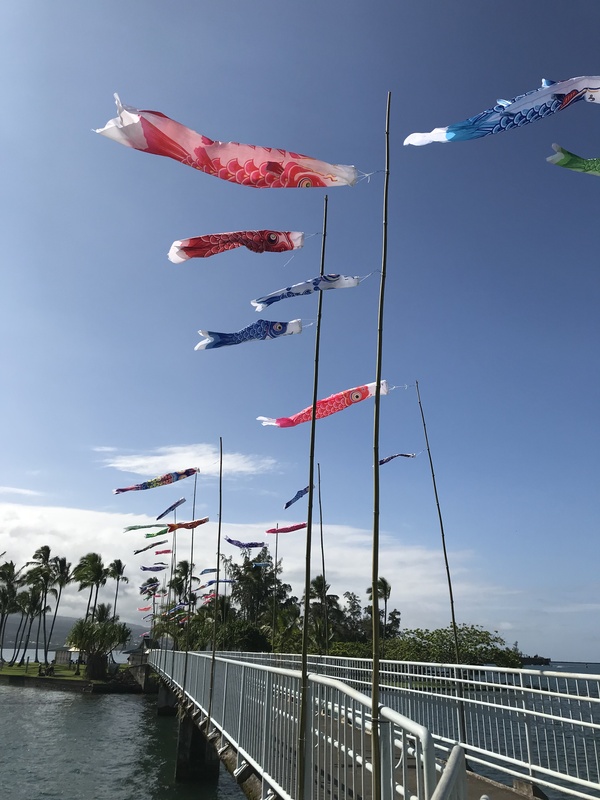 If you have koi nobori to donate or wish to help with assembly and placement of the poles, please meet Friends of Lili`uokalani Gardens at 9 a.m. on Tuesday, April 30. 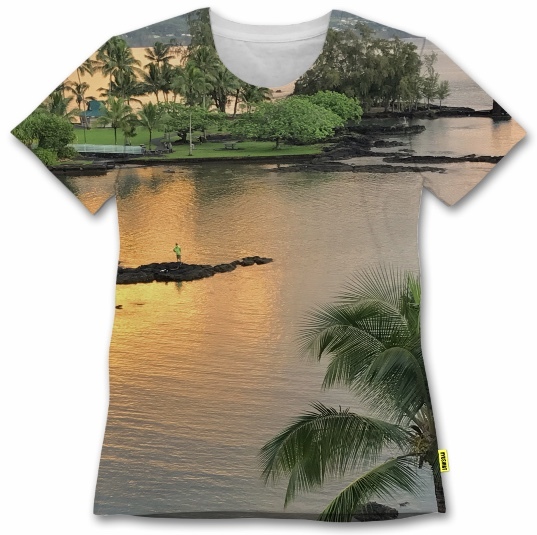 Koi nobori may be viewed at Suisan Fish Market, Hilo Bay Cafe, Pandamonia’s Paleta Palace, Shoroan, Lili`uokalani Gardens, Banyan Gallery, Hilo Hawaiian Hotel, Grand Naniloa Resort, and across the bridge to Mokuola. The bamboo poles remain in place through the annual Rotary Club of South Hilo fundraiser Hilo Huli on Sunday, May 5. Here is a link to the Rotary Club of South Hilo page on Facebook and the event where you may order tickets. 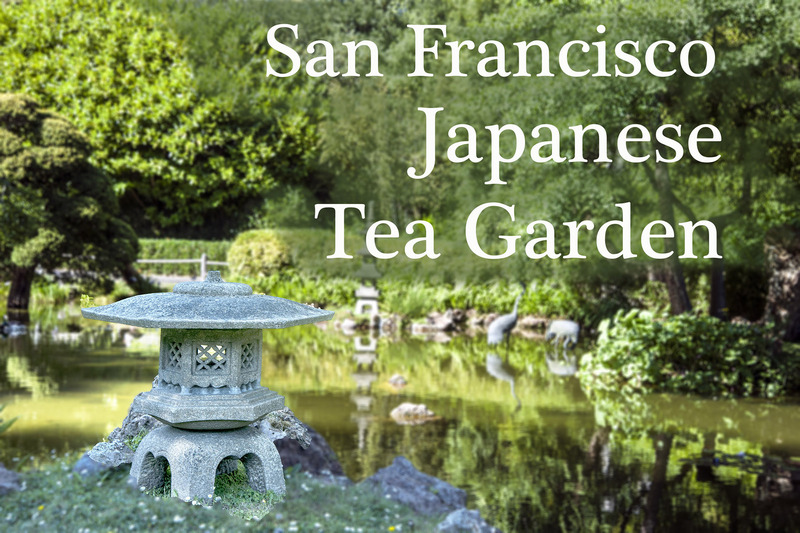 The North American Japanese Garden Association will hold a spring regional event at the Japanese Tea Garden in San Francisco in April. 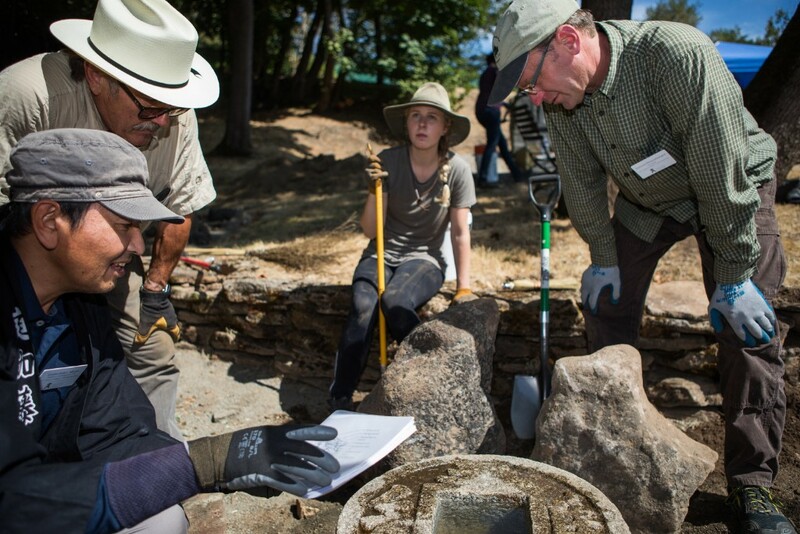 “The Past Becomes Present: A Design Workshop” will be held Friday and Saturday, April 5 and 6. Advance registration is necessary. 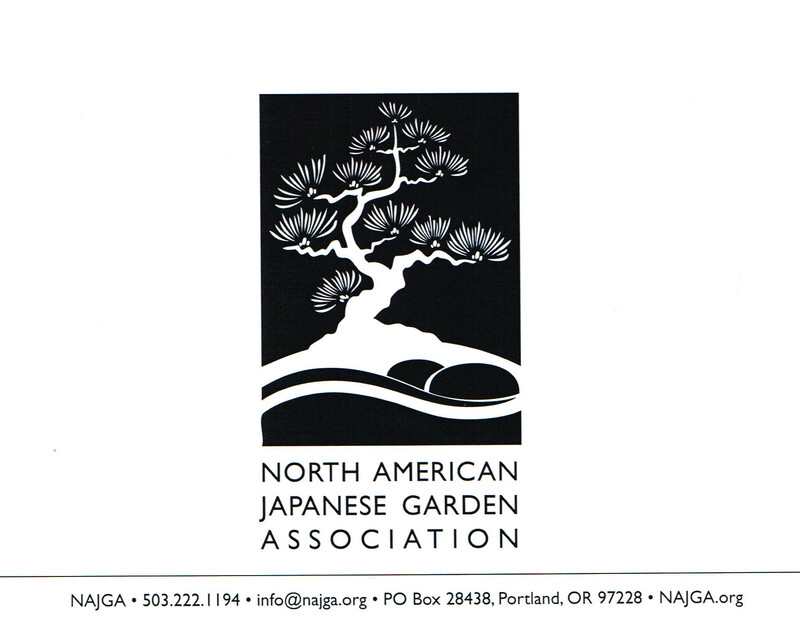 Please go to the NAJGA web site for more information and to register. 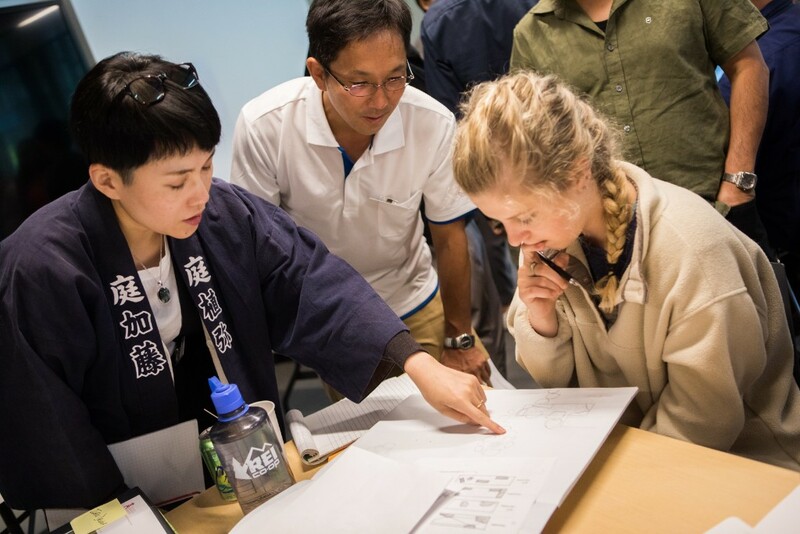 Are you looking for an opportunity to enhance your Japanese landscape skills? 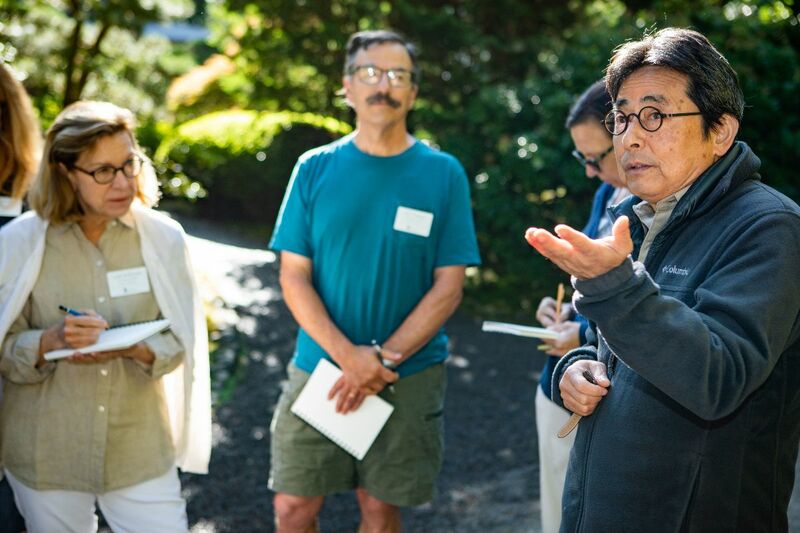 Portland Japanese Garden offers an amazing opportunity to learn stone setting, bamboo fence construction, and other skills including tools, aesthetics, and history. 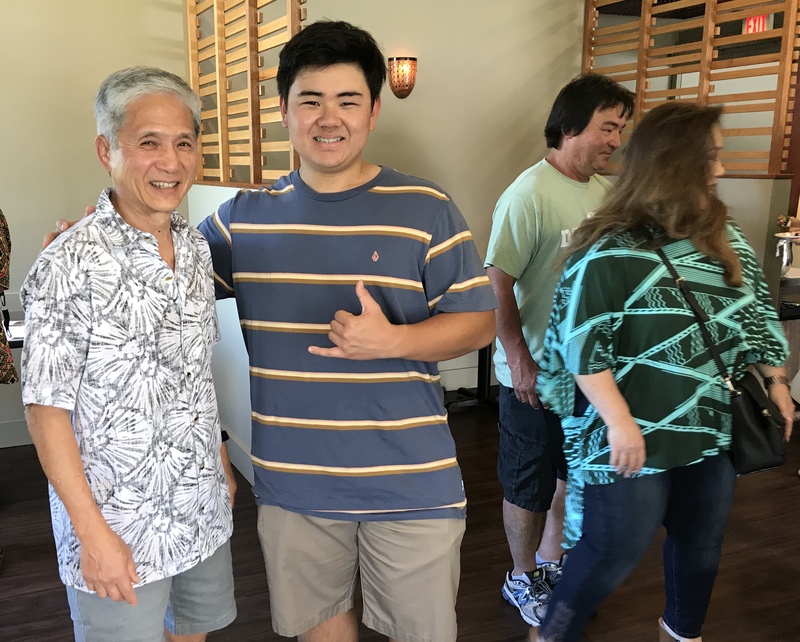 Meanwhile, in Hilo a pruning class will be taught by Dennis Makishima in Lili`uokalani Gardens Tuesday and Wednesday, March 19 and 20. Advance registration is required. The course is geared toward public park maintenance personnel, Master Gardeners, and active landscape industry workers. Registration for this workshop is closed with 50 registrants and a small waiting list. No more registrants can be accommodated. More workshops will be held in the future. Register early. UPDATE: As of Monday, February 25, class registration is full with 50 participants. There is a small waiting list. 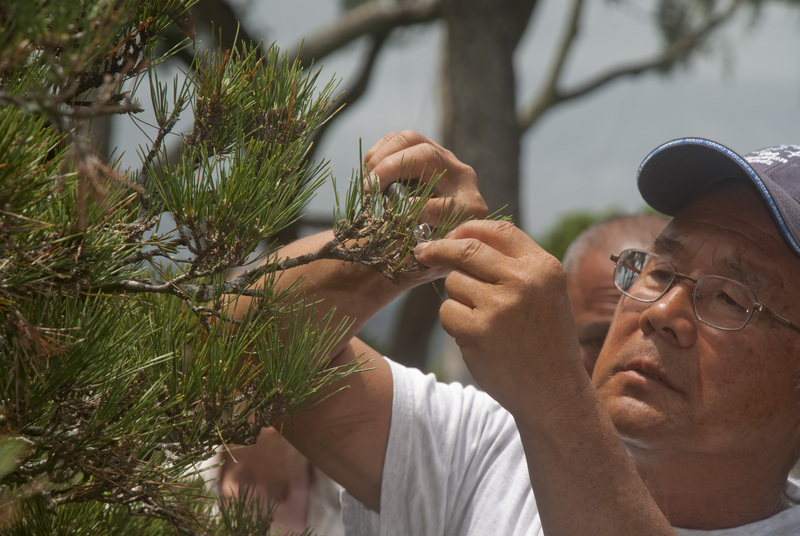 Dennis demonstrates how to handle black pine in a tropical climate. Dennis is the founder of the Merritt College (Oakland, California) aesthetic tree pruning program. He is a past president of the Golden State Bonsai Federation. Dennis used to come to Hawaii annually to help with the bonsai show at the Okinawa Festival in Honolulu. Now he says he’s retired, but Dennis is coming to Hawaii in March to work on clients’ trees over two weekends on Oahu. 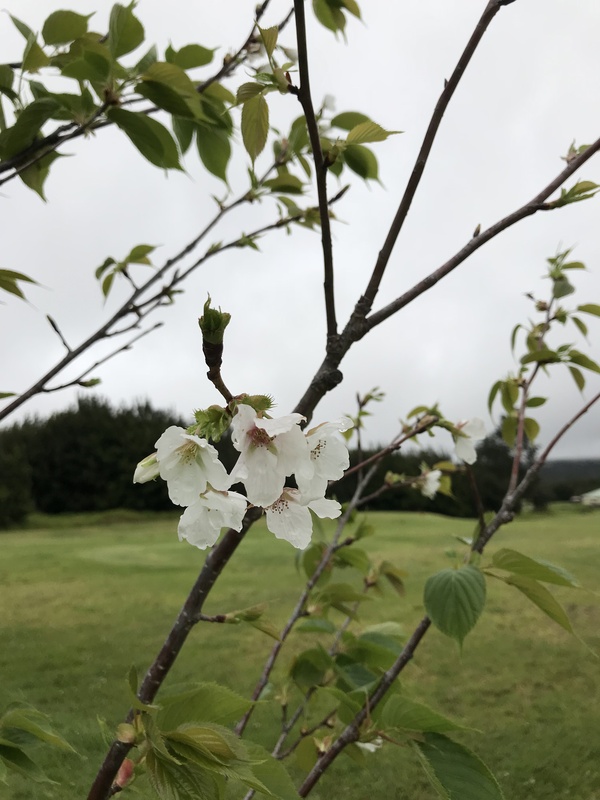 In between, Dennis will return to Hilo to teach pruning workshops to County park maintenance personnel, local landscapers, and Master Gardeners. Registration in advance is required for the two-day workshop Tuesday and Wednesday, March 19 and 20. His pruning career started in 1980 when he was working for a produce store in Berkeley. He and a plumber friend traded labor and Dennis pruned his first black pine tree. 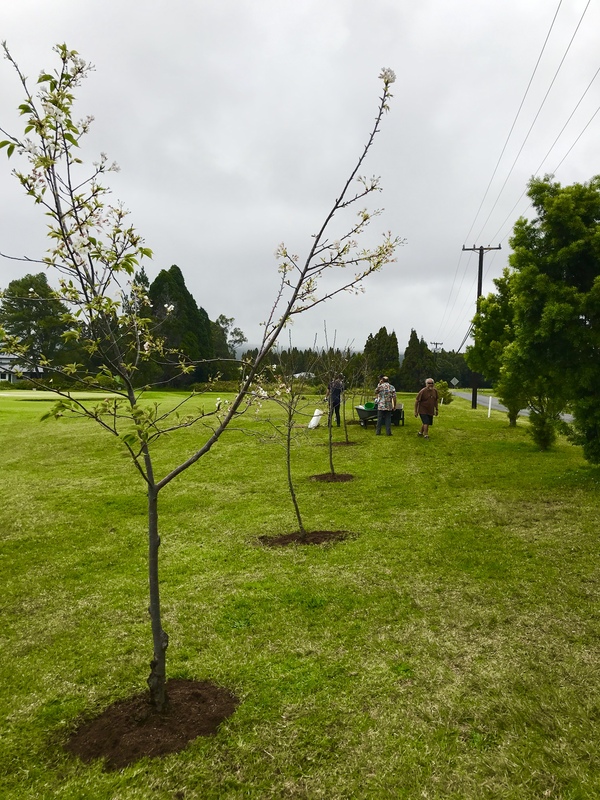 Over the years, Dennis studied urban horticulture and developed multi-year plans to work on clients trees. While taking a horticulture class at Merritt College, a team project tackled the pruning of a maple tree on campus. Student interest led to the formation of an aesthetic pruning series as well as a continuing organization that offers a certification program. 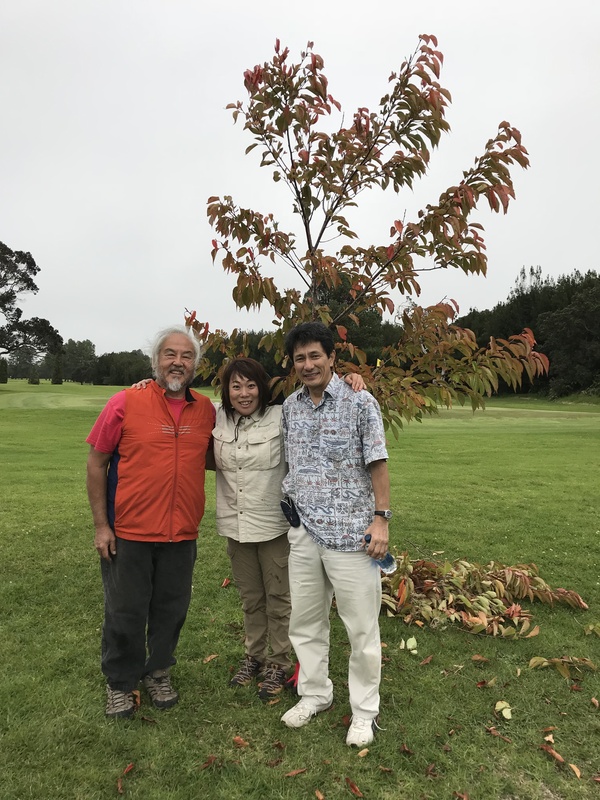 “His teaching and leadership made it possible for pruners to make a living at aesthetically pruning trees,” said Randall Lee, president of the Aesthetic Pruners Association. Lee said he learned under Makishima starting around 1988 and said he would not have been an aesthetic pruner without him. Lee said many pruners now advertise themselves as aesthetic pruners, and his organization, founded 10 years ago, was started to certify and support them. The association’s website lists 77 affiliated pruners throughout the United States. The two-day workshop will be held in Lili`uokalani Gardens Tuesday and Wednesday, March 19 and 20, from 7:45 a.m. to 1:45 p.m. each day rain or shine. Lunch, refreshments, and workshop materials are included in the $15 registration cost. Meet at the old sumo ring, a shelter near the tea house and parking lot off Banyan Drive. To reserve a space, contact K.T. Cannon-Eger at kteger@hawaii.rr.com or phone (808) 895-8130. 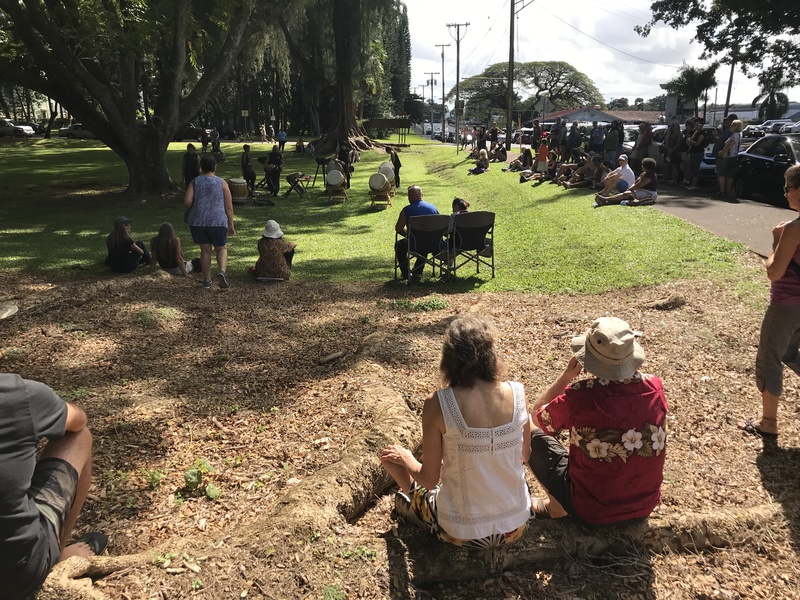 Saturday, January 12, dawned with light rain and thick clouds, but by the time organizers arrived at Lili`uokalani Gardens to set up for the third annual Banyan Drive Art Stroll, the skies were clear and remained that way all day. 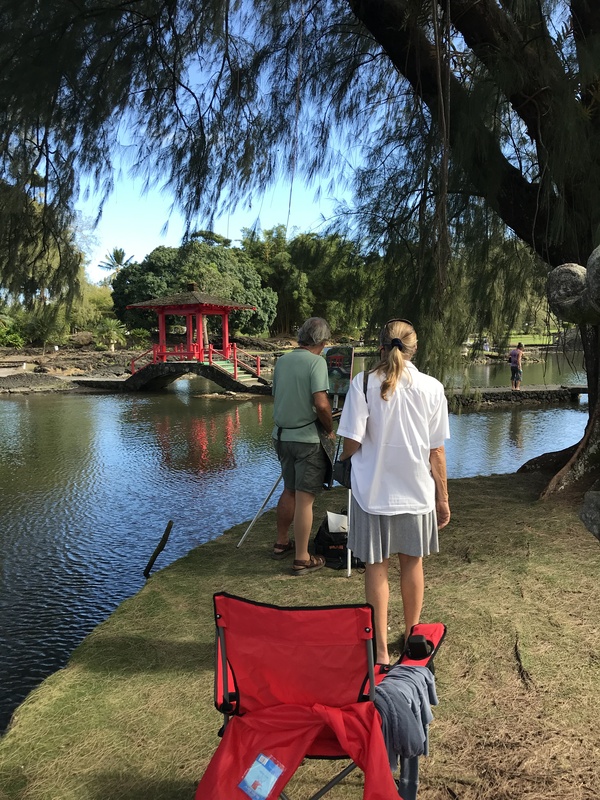 An estimated 1,200 people wandered through Lili`uokalani Gardens to watch plein air painters at work or take a tour from one of four photographers whose images were included in the 2019 calendar. 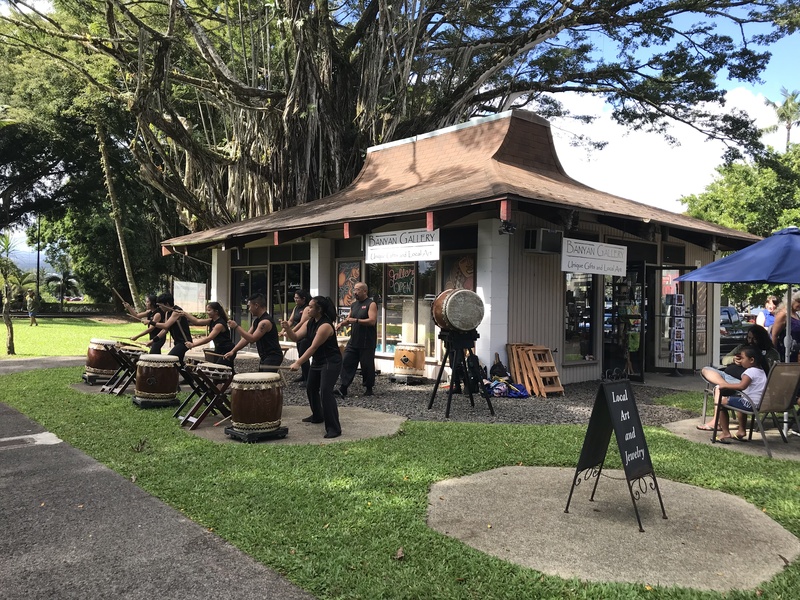 Kicking off the Art Stroll at noon was Puna Taiko performing outside Banyan Gallery where door prizes were awarded all day. Puna Taiko also performed outside Hilo Bay Cafe where the photography calendar exhibit was held. Puna Taiko opened the day at noon outside Banyan Gallery. 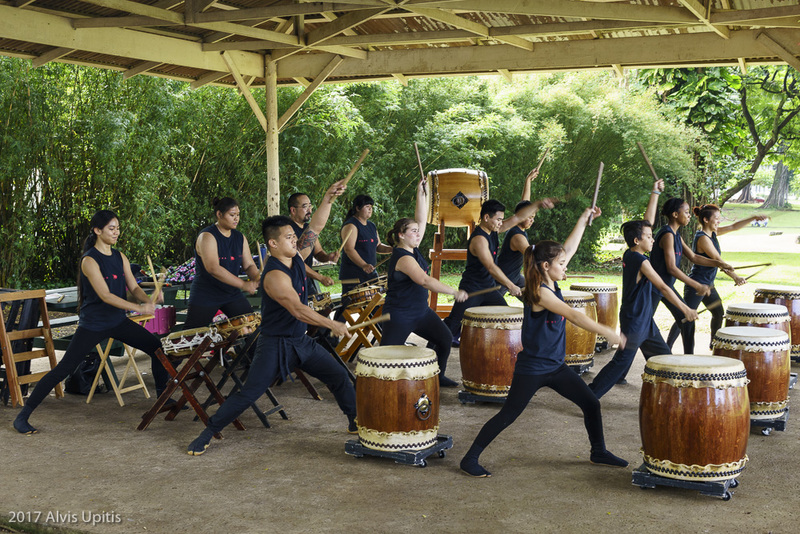 Puna Taiko’s second performance was in the gardens across from Hilo Bay Cafe. Kenji Kuroshima is a man of many talents among which is professional photographer at the Merrie Monarch Festival. Kenji gave a short talk on site selection and camera gear during the Banyan Drive Art Stroll. His image was selected as the featured calendar page for January 2020. Visible in the background are two sets of plein air painters. Jay Takaaze was awarded Grand Prize from Paradise Helicopters for his image “Morning Moon” which was selected for the cover image as well as for the month of December. This image also was selected in People’s Choice balloting for an award from Cunningham Gallery. 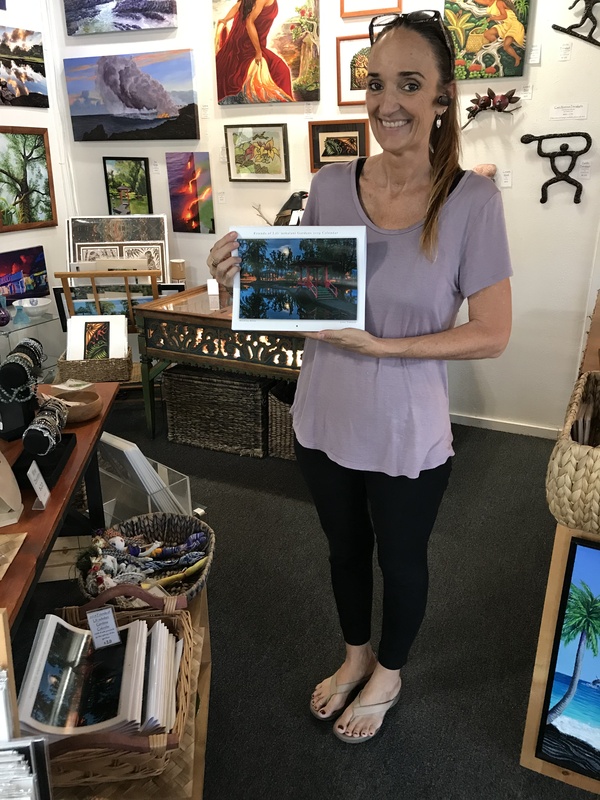 A few calendars remain for sale at the Banyan Gallery near Hilo Hawaiian Hotel. 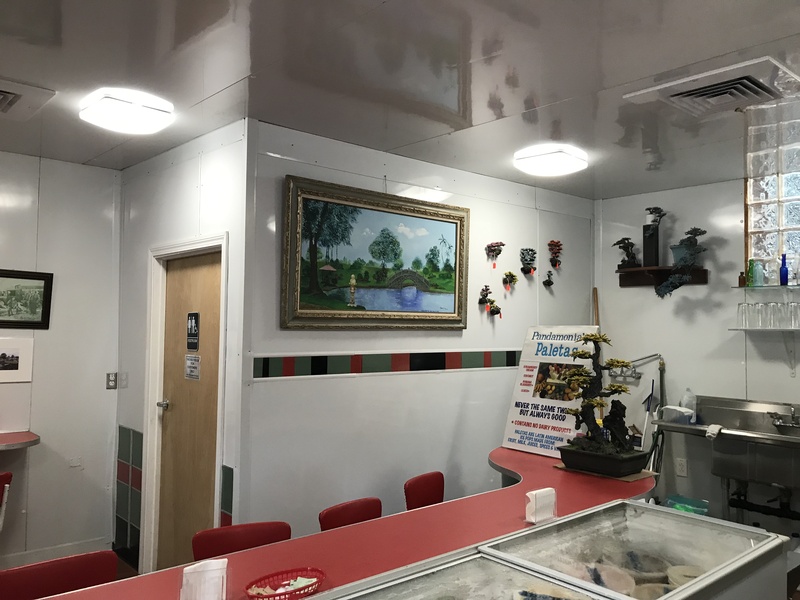 The route included historic photos at Pandamonia’s Paleta Palace and a family treasure of a painting of the iconic arched stone bridge. 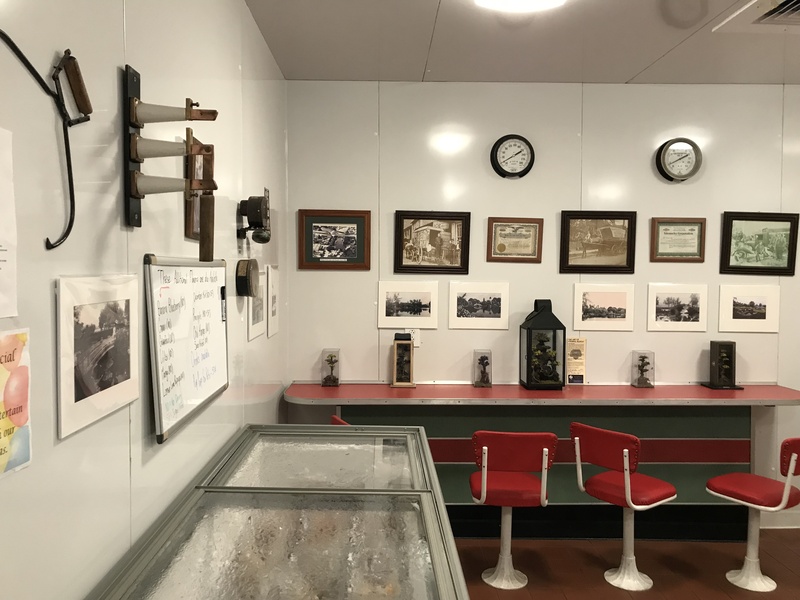 A row of historic photos, in white mats arranged chronologically, tell the story of the Kushi Bridge, the iconic arched stone bridge from the 1920s through 1970s. Les Takayamas grandfather built the Kushi Bridge in the 1930s. The family loaned a treasured painting of the scene to the Banyan Drive Art Stroll for the day. 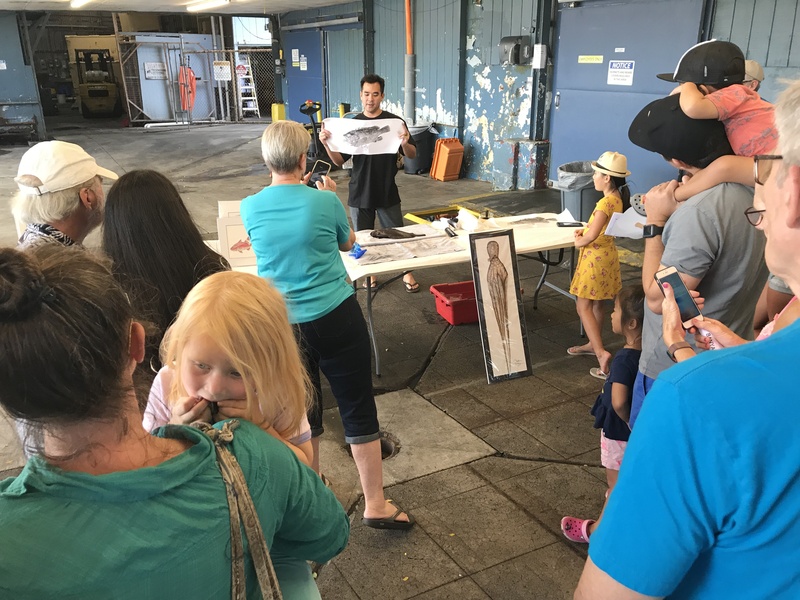 Suisan Fish Market hosted Brandon Tengan of Oahu with a demonstration of fish printing. Gyotaku was a way of documenting a fisherman’s catch. It evolved into an art form. 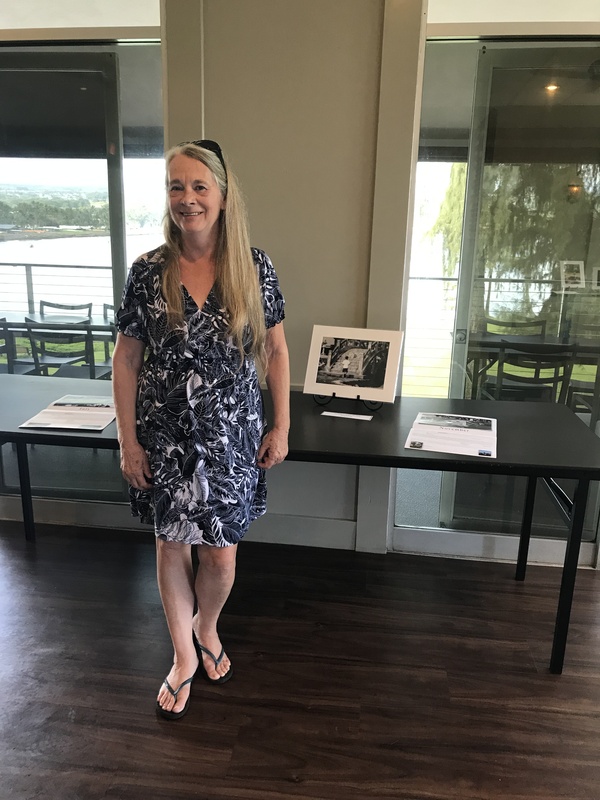 Silent Auction items, a pastel demonstration by Patti Pease Johnson, and music by harpist Cymber Quinn were featured in the Wai`oli Lounge of the Castle Hilo Hawaiian Hotel. Nearby, door prizes were given away on the hour at Banyan Gallery. 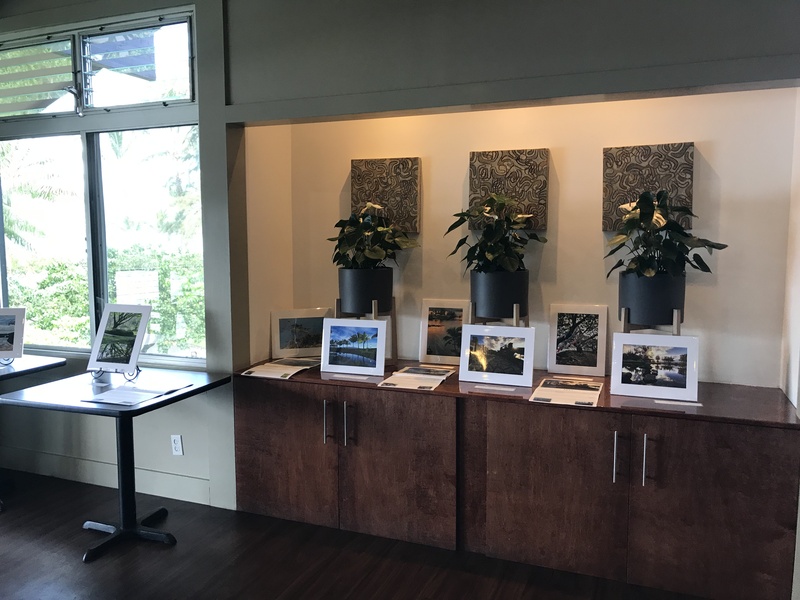 At the east end of the Banyan Drive Art Stroll, a judged art exhibit was on display at the Palm Room of the Grand Naniloa Resort. Ken Charon demonstrated drawing during the afternoon. Jared Goodwin’s “Mokuola Sunset” took first place in the 3rd annual Banyan Drive Art Stroll judged entries. “Red Bridge” by painter Bonnie Sol Hahn took second place in the judged competition. 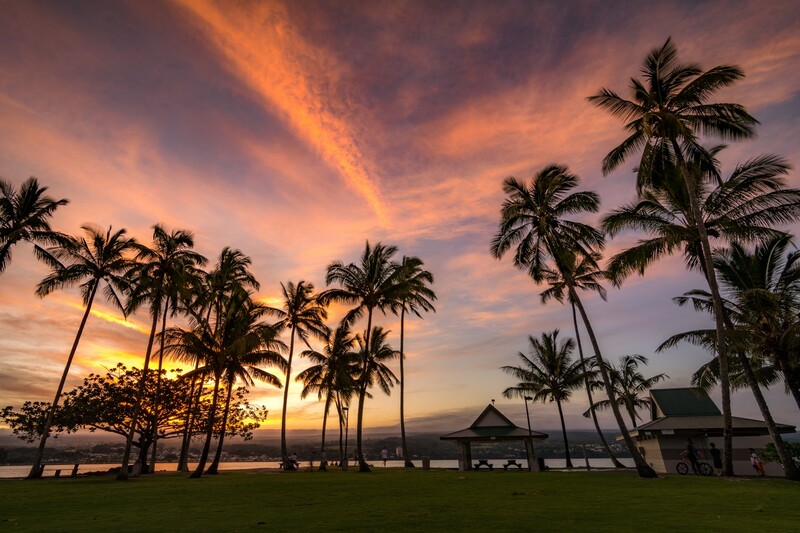 “Good Morning” by Jay Takaaze, a frequent visitor to Lili`uokalani Gardens, took third place. 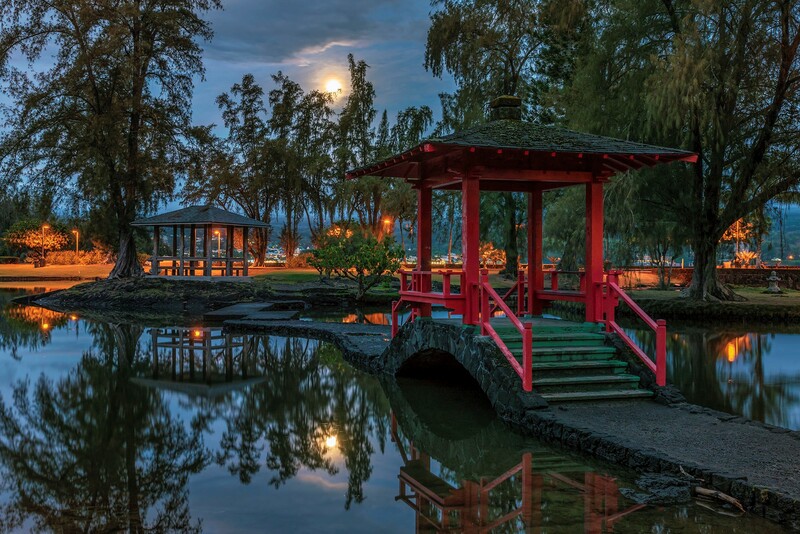 Another Takaaze image “Morning Moon” was awarded grand prize in the 2019 Friends of Lili`uokalani Gardens calendar contest. 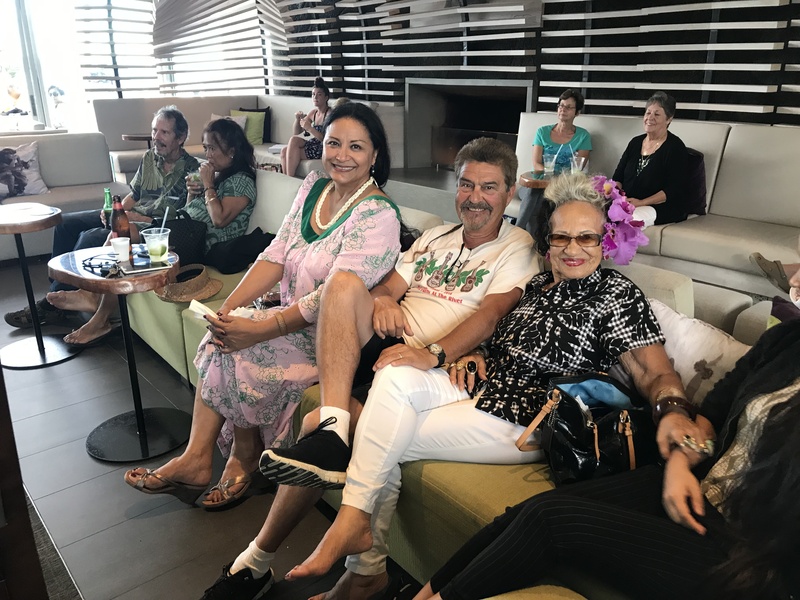 Desiree Moana Cruz was mistress of ceremonies for live entertainment in the lobby lounge of the Grand Naniloa Resort. Friends of Lili`uokalani Gardens is a 501(c)(3) non-profit dedicated to fostering Hilo’s treasured cultural landscape. 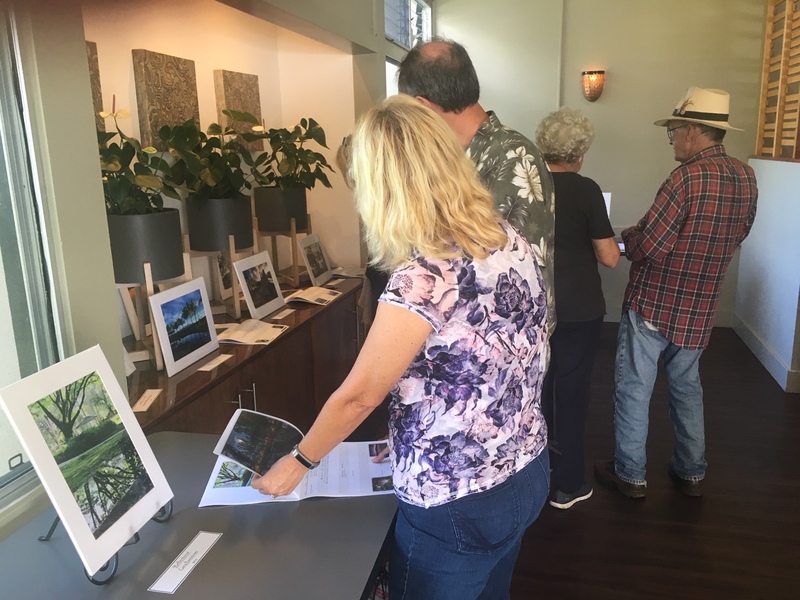 The Banyan Drive Art Stroll is one of several e vents designed to celebrate the gardens centennial. For more information and to stay up to date on planned volunteer days and special events, please visit the Facebook page of Friends of Lili`uokalani Gardens. 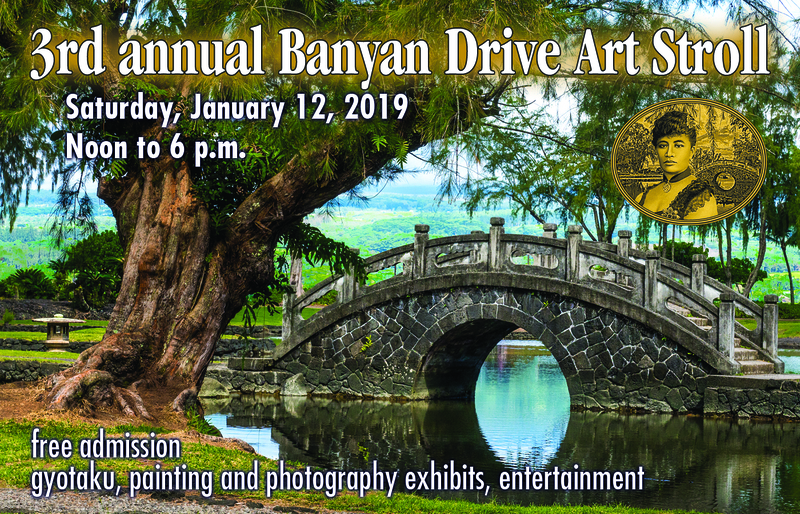 The third annual Banyan Drive Art Stroll features exhibits, awards, prizes, entertainment, and activities throughout the Banyan Drive area from noon to 6 p.m. Saturday, January 12, 2019. Jared Goodwin’s “Mokuola Sunset” took first place in the third annual Banyan Drive Art Stroll judged entries. 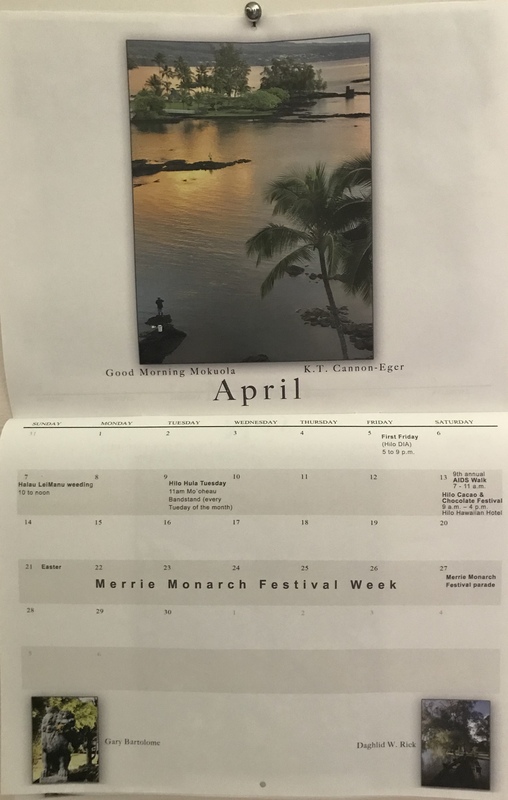 A senior at Hilo High School, Goodwin won last year’s photography contest with the cover for the 2018 Friends of Lili`uokalani Gardens calendar. 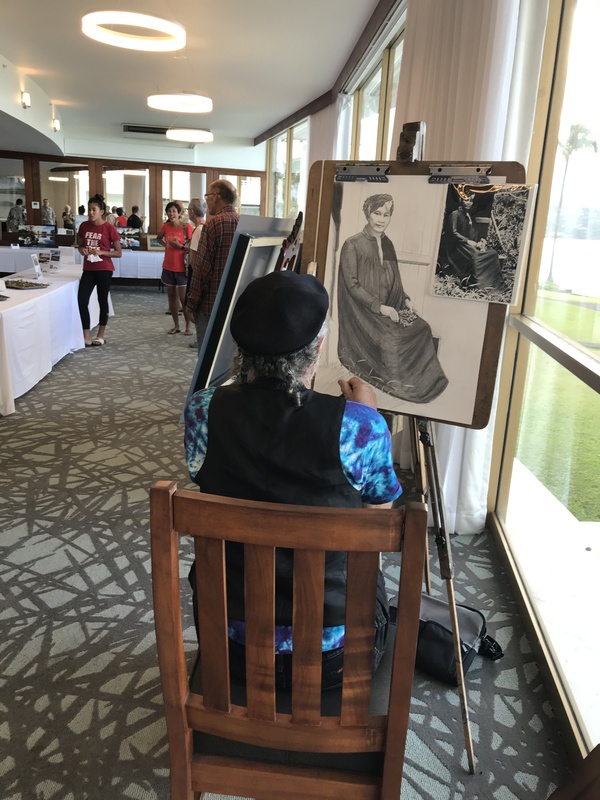 A judged art exhibit will be available for viewing and People’s Choice voting in the Palm Room at the Grand Naniloa Resort. 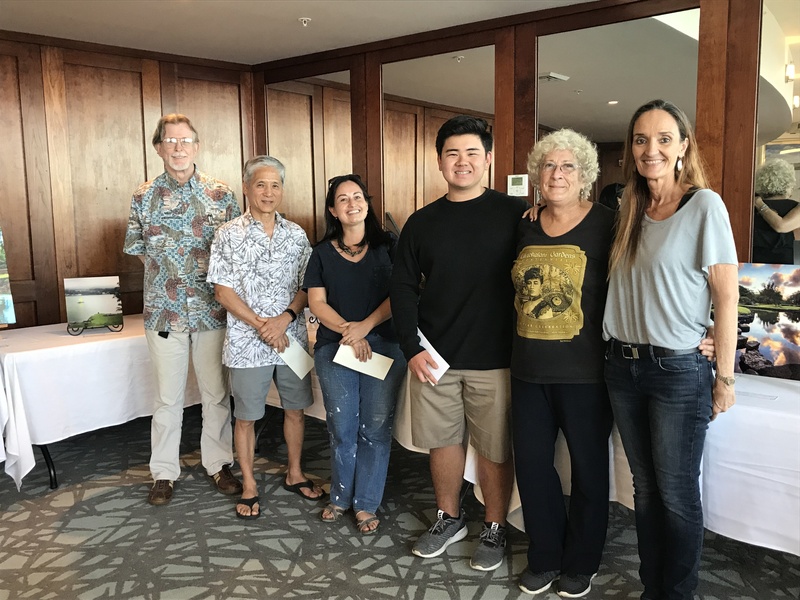 Judge Emily Catey Weiss of the Volcano Art Center will be on hand to present awards to first place Jared Goodwin “Mokuola Sunset”, second place Bonnie Sol Hahn “Red Bridge”, and third place Jay Takaaze “Good Morning” with honorable mention to Stephen Davies “Just Walking the Dog”. The People’s Choice award will be presented after the event when votes are counted. 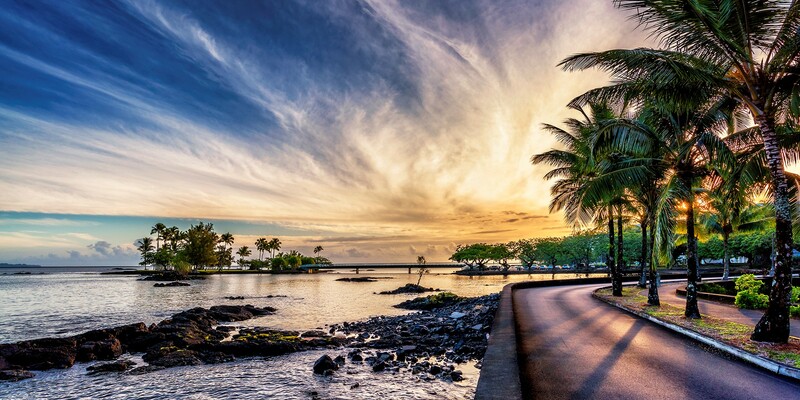 A photography exhibit will be held in Hilo Bay Café with voting for People’s Choice. The grand prize will be presented by Paradise Helicopters at 2 p.m. to Jay Takaaze whose image “Morning Moon” was selected for the cover of the 2019 Friends of Lili`uokalani Gardens calendar. Judge for the calendar was Mary Goodrich. Artists at work are a featured item of the Banyan Drive Art Stroll. 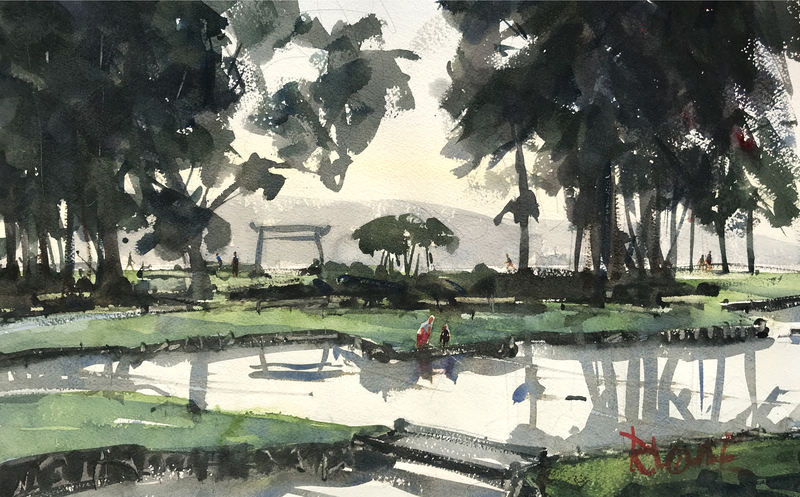 Plein air artists will be in Lili`uokalani Gardens from noon to 3 p.m. including Marilyn Montgomery, Yumi Doi, William Wingert, Kevin Spitze, Peter Heinemann and the Hilo Plein Air Group. Photographers will give tours/talks at the sites of their calendar images during the same time frame. 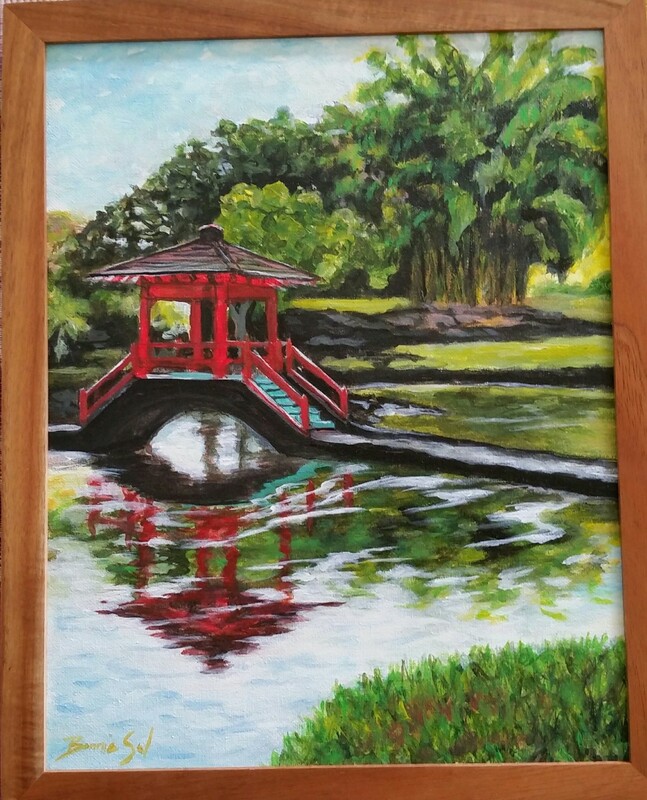 Patti Pease Johnson will demonstrate pastel painting at the Waioli Lounge in Hilo Hawaiian from 2 to 6 p.m. Brandon Tengan will demonstrate gyotaku (fish printing) at Suisan from 3 to 4 p.m. Ken Charon will demonstrate painting in the Palm Room of the Grand Naniloa Resort from 2 to 6 p.m.
Entertainment is scheduled throughout the day starting with Puna Taiko at noon near Banyan Gallery. 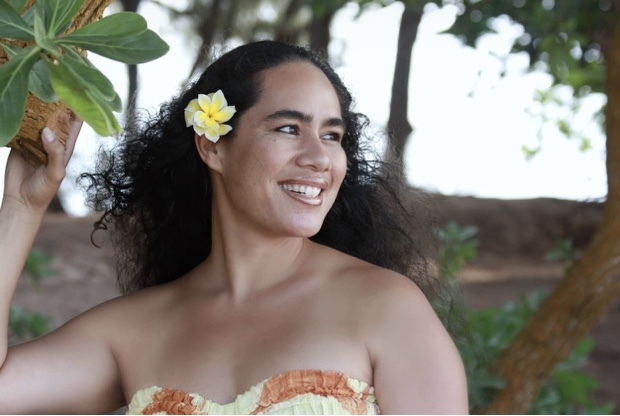 Puna Taiko will move to an area outside Hilo Bay Café around 1 p.m. Harpist Cymber Quinn will play in the Wai`oli Lounge at Hilo Hawaiian from 2 to 3 p.m. Desiree Moana Cruz will be mistress of ceremonies at the lobby lounge of the Grand Naniloa Resort. 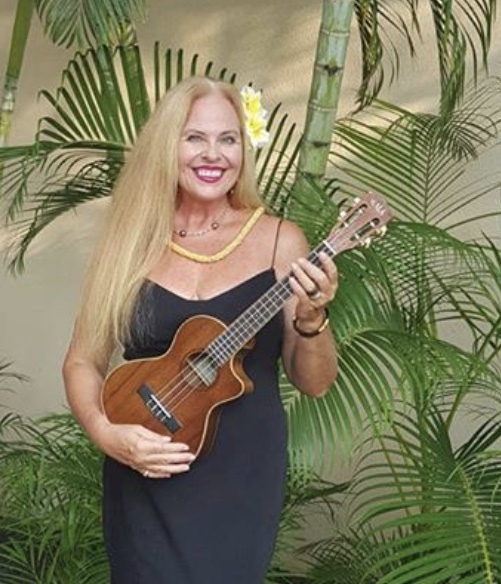 Featured performers there are Christy Lassiter and Friends noon to 2 p.m., Kainani Kahaunaele 2 to 4 p.m., and Mark Yamanaka 4 to 6 p.m.
Puna Taiko has performed at every Banyan Drive Art Stroll. Shown here in an image by Alvis Upitis, their energy and original compositions always draw a crowd. A complete schedule by venue follows. A printed map brochure with the schedule will be available at all sponsor locations along the stroll. Sponsors for the third annual Banyan Drive Art Stroll include: Banyan Gallery, Suisan Fish Market, Hilo Bay Café, Pandamonia’s Paleta Palace, County of Hawai`i Parks and Recreation Department, Castle Hilo Hawaiian Hotel, Grand Naniloa Resort, Paradise Helicopters, Akamai Art Supply, Cunningham Gallery, and Friends of Lili`uokalani Gardens. UPDATE: a re-dedication blessing will be held for the recently restored stone lanterns from Okinawa and Yamanashi prefectures. Rev. Naoiro Hotta will conduct a short service at 9:30 a.m. on a flat lawn area near the stone bridge in between the two lanterns. Look for the grey canopy. 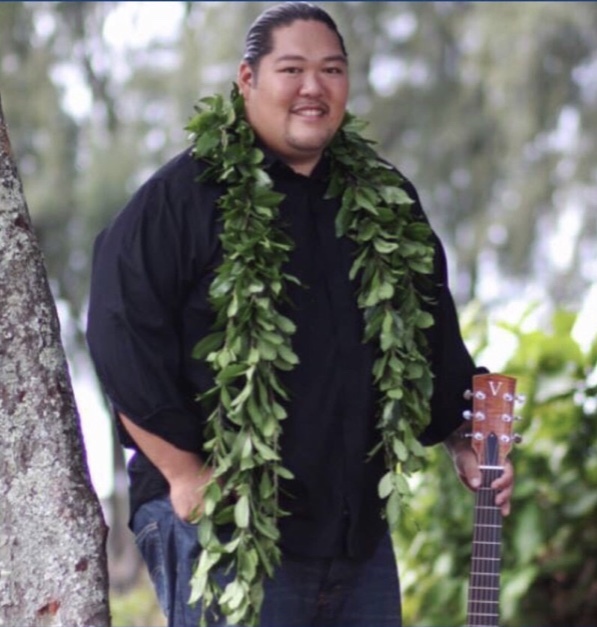 Kumu Kaho`okele Crabbe will offer an Hawaiian blessing at 10 a.m. to open the gardens for the new year, especially on this occasion of the first centennial event of 2019. Any Kine Wontons will be available in the Suisan parking lot from noon until sold out or 6 p.m., whichever comes first. Puna Taiko outside at 1 p.m.
Grand Prize award and pupu 2 p.m.
Patty Pease Johnson, pastel demonstration 2-6 p.m.
Music: Cymber Quinn 2 – 3 p.m.
judge’s art prizes awarded 5 p.m.